This is the first week of my thesis. There is so much work to do and I have trouble to find a good start. The battery management controllers (BMCs) form the basis of my project. So I ordered all parts necessary some weeks ago and they arrived. It took me a whole day to unwrap, sort and label them. All connectors, pins, capacitors, resistors and tiny ICs are now boxed and labeled and are waiting to be soldered. I've ordered parts and PCBs for 25 BMCs, three will be used for my battery management system (BMS). I think 250 parts have to be mounted on each BMC...that's a lot of stupid work for the next weeks. Unfortunately I'm still missing some important ICs. Sorting was so boring, that's why I helped my college Chris to disassemble our second buggy.The buggies are normally running on gasoline with a combustion engine. The engine of my buggy is already removed and replaced with a 10kW DC motor. Chris' thesis is about drive trains and the conversion from combustion to electrical engines. He'll construct a new drive train with two DC motors and two independent driving shafts. The plan is the experiment and implement a virtual differential. But first, we had to get rid of the old-school combustion engine. This is me trying to unfasten the screws at the engine. On top you can see the cooler and on the bottom the gear box. The wheels are connected with cardan shafts to the gear box. This is just a closer view. This is the gasoline tank located directly above the engine. The tank is removed. Now the engine can be seen. The black box is an air filter connected to the damper flap on the right. The motor is directly beneath the damper flap. The golden tube in the middle is the electrical starter for the motor. Here we drain the cooling fluid out of the cooler to remove it. It's very important to protect eyes and hands and the fluid must be disposed of as hazardous waste. The oil is removed and the cardan shafts are dismounted from the gear box. After disconnecting a bunch of cables and pipes, we could remove the complete engine from the buggy. We disassembled the gear box to remove the driving shafts from the differential. Chris is trying to reuse them in his construction with the DC motor. Now, everything unimportant is removed and we have enough space for the battery packs, the power electronic and the two DC motors. This was fun, but I had to get back to my work. Unfortunately there were still parts missing, so I started to work on the current measurement. 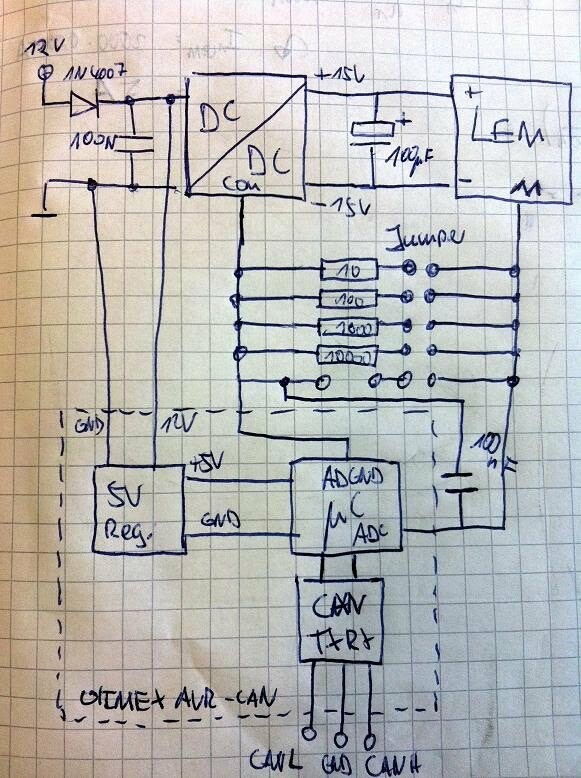 I had the idea to connect a LEM current transducer with a CAN interface. This module can be used everywhere in the car and is able to send the measurements over the CAN bus. 12V are supplied from the on-board power supply. The DC/DC converter generates the -15V to 15V for the LEM (LF 305-S). The 12V are also converted into 5V for the µC. The µC measures the voltage drop across the chosen resistor (10, 100, 1000. 10000Ohm or a custom resistor, which can be plugged in). A small capacitor filters some noise for better results. The current through the wire is calculated in the µC according to the measured voltage across the shunt resistor and packaged in a CAN message frame. This is the first prototype. I'll add the "LEM-CAN" as a project with source code and schematics later. The first prototype works pretty well, but needs to be calibrated. I will do an eagle layout for the next prototype and print it on PCB to make it smaller. I'll skip the CAN eva-board and place everything on my PCB. The module will be mounted near the battery packs. The spots 1 and 2 are the possible location for the current measurement. 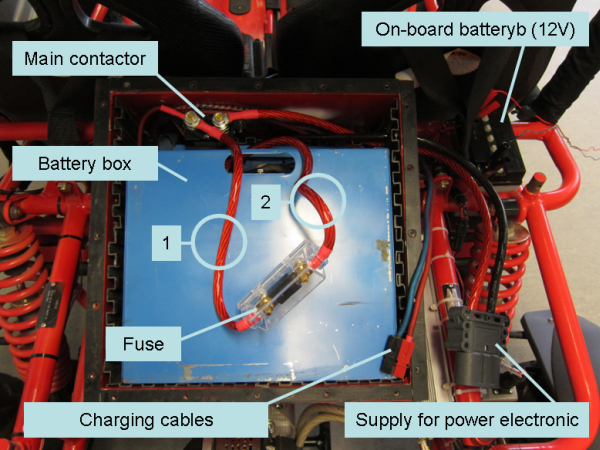 The cable is directly connected between contactor and battery packs (with a 200A fuse in between). The charging cable is connected as well. With only one sensor, it's possible to collect data about the discharging as well as the charging current. One problem is, the LEM transducer has a positive current direction. If the current flows in the opposite direction, the voltage drop across the shunt resistor would be negative as well. Therefore I need either an AD converter, which can measure convert negative voltages, or a precise rectifier with some logic to detect the direction of the current. I go with a 12bit ADC, which can measure -5V to 5V. It's the MAX186 (datasheet from MAXIM). It uses SPI for communication. There is still some space on the first prototype board, so I keep experimenting with this one.